MOANAA streams full “Passage” album! Poland’s post-metal alchemists MOANAA just released it’s sophomore effort – ‘Passage’ It comes in waves. Mounting. Slowly unfolding. The second coming of MOANAA. Being no newcomer to their country’s ever-blooming metal scene, the band streams new album which just been released by Arachnophobia Records. 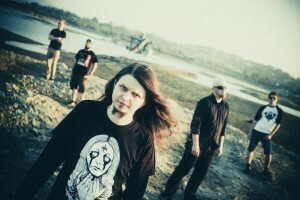 Based in Southern Poland, the five-piece have already managed to self-release a full-length debut, titled “Descent” (2014) and tour a serious roll of places in their native country, most recently including the Days of No Light Tour with Blaze of Perdition and Mord’A’Stigmata, as well as this year’s Castle Party in Bolków, where they shared the altar of the post-evangelical church with Furia inter alia. Having partnered with Arachnophobia Records, they still have the best ahead of them with “Passage” being a first step. Tracked at Heaven’s Sound Studio by Marcin Piekło, with the vocals recording done by Nihil at the infamous Czyściec Studio and mixing by Haldor Grunberg at Satanic Audio, the record captures a wide and rich sonic universe Moanaa has to offer. It is highly recommended for you to step on.